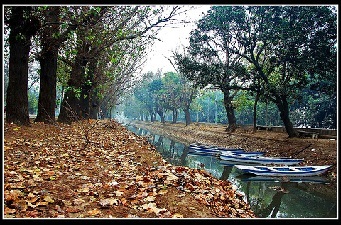 Lahore during a chilly morning in January! With 2011 coming to an end, December in the country has been unusually dry with four winter systems but none of these having the potential to cause meaningful precipitation in the country. However season’s first snowfall occurred in many mountainous regions of the country including Murree. Southern parts of the country including Karachi saw the season’s first moderate cold wave that made the weather chilly as temperature dropped to 7°C. Whats in 2012? *Two western disturbance to affect the northern half country. *Mostly dry continental air expected in the southern half of the country. Western disturbance 04 affected Northern Pakistan from October 20 till October 23 night, temperature dropped by 3°C to 1 °C, 79 km/h winds were blowing in Islamabad. Western disturbance 07 , a large westerly wave in nature affected central and upper pats from November 8 morning till November 10, it trough interacted with deep depression ARB 03. Western disturbance 08, a feeble system, approached northern Pakistan on November 15 and moved in an eastern direction on November 19. Western disturbance 09, a shallow weather system, approached Pakistan on November 21 and caused isolated snowfall in Swat valley. Western disturbance 10, first weather system of December,moved towards Pakistan from December 5 and persisted till 8. It caused first winter showers in Lahore on December 6. Western disturbance 11 reached the country on December 11 and moved eastwards on December 22, caused drizzle in Lahore while isolated snowfall over northern Pakistan. Due to this WD, the southern parts of the country came under a moderate cold wave. Western disturbance 12 reached the country on December 27 till December 28, it mainly affected the extreme northern areas of the country with drizzle and cloud-cover. The WD was weak in nature. It is the fourth winter system to affect the northern areas of the country (extreme). It is weak in nature and it is moving eastwards. It reached extreme upper parts of Pakistan today (December 30) and is likely to move eastwards on January 1. It is not likely have any major impact expect some spotty activity over Gilgit region and adjoining Indian Kashmir; and decrease of temperatures in the many parts of the country is expected from WD 13. WD 14 is likely to affect the north-western parts of the country including Balochistan, Islamabad, Khyber and Gilgit. From January 4 till January 6, there are chances of moderate intensity rainfall/showers in Islamabad, Quetta, Peshawar and adjoining cities with fast winds. It is also likely to cause snowfall over Khyber, Gilgit and Kashmir, the winter system could cause partly/mostly cloudy weather in Lahore as well as Multan with changes of drizzle/isolate light rainfall. Most days would have northerly/north-eastern winds in Karachi as NW wind pattern from Iran and Afghanistan would dominate the southern parts of the country. WD 13 and WD 14 both would affect the weather of the southern parts of the country in the coming week. Temperatures as forecasted by PWP on its Daily updates, will once again start to decrease from the weekend that is December 31 till January 3 as night temperatures would range from 11°C – 8 °C. The early days of the first week could be the most coolest of them all in the city. Due to WD 14, some cloudy activity could occur the city on December 4 and December 5 as clouds would move over the city from Makran coast and adjoining Arabian sea with chances of drizzle/spotty shower. Overall Western disturbance 14 has the potential to grip the whole country with cloudy cover in the coming week. ← Climate change behind Sindh floods! mr admin what is a wd you mention in your article>? Western disturbance never gives rains to karachi and sindh but it gives heavy downpours to snow each year over and near balchostain,Punjab,nwfp and kashmir and all upper sided areas of south asia.